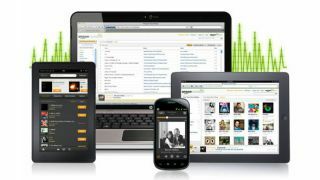 Amazon has revealed that it has launched its Cloud Player service in the UK. The iTunes Match rival allows users to store their music in the cloud, for playback on Android and iOS devices, as well as Mac and PCs and will convert poor quality files to 256Kbps audio. From now on, anyone who buys an Amazon MP3 will find that there files are automatically saved to the cloud free of charge – in all there's space for 250 songs (5GB) before you have to sign up to the premium version of the service. Amazon Cloud Player sits alongside Cloud Drive – a service that offers £6 a year for 20GB of space to £320 a year for 1TB of space. For Cloud Player itself, £21.99 a year will allow you to import 250,000 songs. By sheer coincidence this is the same price as iTunes Match. Speaking about the move to the UK, Greg Greeley, Vice President of EU Retail at Amazon, said: "Millions of US customers are already using Amazon Cloud Player to listen to their music everywhere, on their favourite devices, including Kindle Fire, Android phones and tablets, iPhones, iPod Touches, Macs and PCs. We're excited to bring this same convenience to Amazon music customers in the UK. "The launch of Cloud Player in the UK means that customers can buy anywhere, play anywhere, and keep all of their music in one place without the need for constant software updates, or drives and cables to move and manage their music." Head over to www.amazon.co.uk/clouddrive to find out more.